Bed and Breakfast Mid Wales, Ty Coch "The Red House"
Ty Coch ('The Red House' in Welsh) is an award winning, 4 star rated, fully intact Victorian water mill and bed and breakfast located in the heart of Mid Wales. The traditional Welsh longhouse is believed to date from 1650 and the adjacent overshot water wheel was built in the early 1800s to power the traditional carpentry workshop. 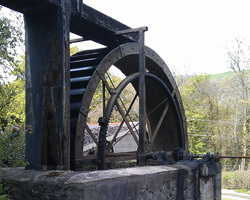 We offer a unique opportunity to stay in this historic working water mill and are happy to run demonstrations on request. Whether you are passing through, staying for the weekend or planning a week's holiday, Ty Coch is the ideal place to re-charge your batteries while experiencing something truly unique. 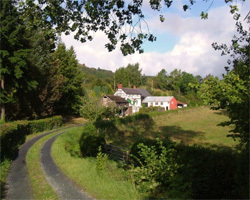 Located in the quiet Welsh village of Pontdolgoch, Ty Coch is ideally situated for exploring some of the best sights and attractions Wales has to offer. We are within an easy drive of Snowdonia National Park, the Brecon Beacons and Portmeirion, while the surrounding Cambrian Mountains and Severn Valley offer superb opportunities for outdoor enthusiasts. Ty Coch mill offers a relaxing retreat in a traditional atmosphere that promises to be a truly unique experience. Situated in a 10 acre small holding and surrounded by the rolling hills of the Welsh Marches the setting and decor of 'The Red House' provides visitors with the feeling of stepping back in time. The longhouse is furnished throughout with antiques and guests have use of our cosy lounge, complete with inglenook fireplace, exposed beams and chesterfield armchairs. 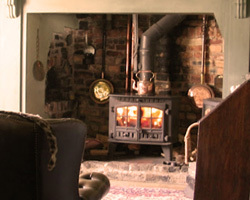 You can enjoy a complimentary warming drink by the wood burning stove or an evening meal prepared on our range using locally sourced, organic ingredients. Many of our ingredients are grown in our own vegetable garden and all of our bread is baked on site. After supper you can take a stroll around our fields or visit some of the local pubs. We are situated in an area where the arts are strongly represented, offering something for every taste; with talented musicians playing traditional and folk music live in local pubs and regular festivals. Events are regularly staged and the community of artisans, craftspeople and artists makes this a very special area. We have plenty of private outdoor parking including under cover parking for classic, open-topped cars or motorbikes. 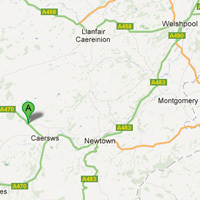 Pets are welcome and we can even provide stabling if arranged in advance. Please let us know if these services are required when booking.